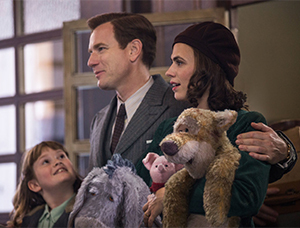 Like Winnie the Pooh’s favorite honey, Christopher Robin is a little sticky and a little sweet, and it’s certainly not served to everyone’s taste. Let’s start at the end, ‘cause that’s when things make sense. No. No. Let’s start after the end, ‘cause that’s when things get weird again. It’s a strange journey to Hundred Acre Wood and it’s an equally strange journey back. But when all is said and done — after all is said and done — in the middle of the end credits there’s an odd little sequence. What appears to be “vintage” footage shows a pianist on a beach. He’s singing Busy Doing Nothing. Shortly, a conga line forms and everybody’s dancing and having a good time. Then a couple of sun worshipers comment on the beach’s newest visitors and say they like what they’re seeing. The camera pans over. What they’re seeing are Pooh and company reclining on beach chairs, wearing sunglasses. It’s a cute moment, no argument there. But it’s also illustrative of how Christopher Robin both works and “not works” all at the same time. While the scene is cute and whimsical, it also plays a little off key. It’s a somber start to this Disney flick. Christopher Robin leaves Hundred Acre Wood and, in the process, puts his childhood behind him. Pooh, Piglet, Tigger and all the other familiar friends are saddened by Christopher’s departure. Christopher then enters boarding school, his father dies, he meets a woman on a bus, they marry, she gets pregnant, he goes off to the front lines of World War II and she gives birth to their daughter while he’s in the trenches. All of that transpires during the opening credits. Then the characters and the story settle in. Christopher (Ewan McGregor, Moulin Rouge!) works for Winslow Luggage Co. in the heart of London. The company’s struggling, even as the post-war era promises prosperity for all. Christopher’s tasked with a glum project: figure out how to cut costs by 20%. Work all weekend and be ready to present to the Board on Monday morning. That means having to stay home while his wife, Evelyn (Hayley Atwell, TV’s Agent Carter), and daughter, Madeline (Bronte Carmichael, On Chesil Beach), go to their summer cottage for a much-needed getaway. The movie most certainly has a worthwhile message, one that resonates today as people reevaluate what it means to be happy and companies scramble to appeal to a changing workforce. “Work-life balance” is a buzz term in recruitment. Unlimited vacation time is a perk offered by some. Flexible work schedules are the new norm. But for Christopher, in the mid-1940s, his plan is to work hard — as hard as he can — so he can enjoy a better life later. As Evelyn asks him, though, “What about now?” The man she fell in love with — playful and fun-loving — is missing in action. And their daughter is growing up without his much-needed attention. Here’s the problem: there’s no sense of magic and Christopher never seems to truly appreciate the return of his Wood friends. As the story unfolds and the action moves — awkwardly — between Hundred Acre Woods and London, a question starts to tickle the back of the mind. Christopher Robin was directed by Marc Forster, a wholly competent director whose catalog includes Finding Neverland (about another Disney staple, Peter Pan) and Quantum of Solace (James Bond). But what if the material were put in the hands of Steven Spielberg? Or maybe Tim Burton? 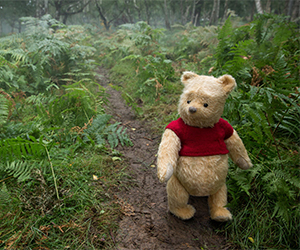 It’s a fantastical situation that lacks the awe-inspiring moment — it needs its scene of pure cinematic magic to transcend and blend the two worlds of London and Hundred Acre Wood. Think of the moment when E.T.’s finger lights up for the first time. Or the all-in playfulness of Pee-Wee’s Big Adventure. Here, the animals of the Wood are treated merely as characters. They live in the woods where Christopher laughed and played as a child. They weren’t a figment of his imagination, they were and are real, much to the gobsmacked befuddlement of every Londoner who catches them talking or moving. There’s no attempt at explaining their existence or their abilities, which makes that magical vibe all the more crucial to the story’s success. Pooh inexplicably exits the tree that faced Christopher’s childhood home and winds up right outside the central London brownstone of his adulthood. That bit in particular is pure laziness in terms of storytelling. It gets the characters back together and — even though Christopher challenges the possibility himself — the machination is shrugged off by Pooh as only Pooh can do. It’s an uneasy mix of wistful fantasy and harsh reality. Maybe it’s simply the by-product of having five disparate writers involved in crafting the story and the screenplay. Too many hands in the honey pot. But here’s the movie’s saving grace: the execution of Pooh and his friends is terrific. Aiming for realism and, essentially, based on the look and feel of the characters in A.A. Milne’s original children’s book, first published in 1926, Pooh (voiced by Jim Cummings, a Pooh veteran from 2011’s Winnie the Pooh) has the joints and movements of an old-school Teddy bear while Eeyore (voiced by Brad Garrett, TV’s Everybody Loves Raymond) has the body of a worn-out plush toy. Watching the trickery of these highly-detailed CGI antique toys interact with the humans is its own magic. That technical execution married with the theme of work-life balance helps Christopher Robin stumble into a mild recommendation. There’s a masterpiece in there scratching inside the tree, waiting to get out. But getting there would require a rewrite, one that’s much more sensitive to the sense of childhood wonder and less fixated on the grind of daily life. Sure, Christopher finds his answer by looking at things differently. It’s a Tao of Pooh moment. But even so, there’s no sense Christopher ever properly learns his lesson of needing to stay in touch with his inner child and to savor the now. He’s let off the hook too easily and the chance for a truly groundbreaking, cross-generational fantasy is left back in the Wood.